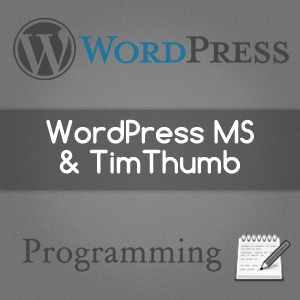 Ever found the necessity to use TimThumb for your WordPress theme and/or plugin? Then you should’ve faced the problem where you can not tell TimThumb about the correct location of image files in WordPress Multi-Site setup and in return TimThumb gave you internal image not found error. The tutorial over binarymoon is a bit backdated as it uses custom fields to get and set the image with TimThumb. The obvious question which arises is, how to use the WordPress’ own featured image with TimThumb to give it maximum resizing capability. Previously, we have discussed about how to get the image src from the featured image HTML and use it for other purposes like CSS etc. Now, we shall see, how to use the original image source and modify it so that it works with TimThumb (for WP MS ofcourse). Which is just the absolute URL of the file. Which is obviously not the absolute static URL of the file. WordPress internally modifies the path via some htaccess rewrite to push the original content at this URL. The main reason why TimThumb doesn’t work is, because, there is no real directory files anywhere on the root of your site. So, we have to either rewrite the URL before passing it to TimThumb or we have to somehow tell TimThumb about this issue. The second solution is not feasible as it involves editing the core of the script, which means, you have to do it again after any update. So, we shall use the first technique within our themes or plugins to make it WP MS compatible. Also, we shall explicitly check the image URL for the presence of /files/ (uploaded media) and /wp-content/ (theme or plugin files) and will treat them properly. * Explicitly check the presence of /files/ and /wp-content/ in the URI and treats accordingly. * Has compatibility for both uploaded media as well as theme/plugin media files. //is it a request for directory wp-content? So that was the most complete and simple solution I could think of while making my WordPress things compatible with MultiSite and TimThumb. If you know any better technique or have any problem using this, then do let us know. Thanks Swashata – I finally got timthumb to work on my multipress site!!! You are a genius!!! I have been crawling the web looking for solutions and every one I tried failed. Yours is the only one that has worked… very well done. I placed your two functions in functions.php and wherever timthumb was called I set the image src to ” />. ooops – code was stripped out….. I give up trying to explain the code I used – lets just say it worked!